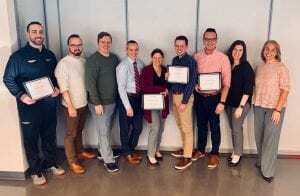 On January 15, the Division of Student Affairs held their annual Divisional Awards, recognizing the amazing work of its members. There were so many great nominations submitted, showcasing the passion, innovation, and inspiration that comes from the staff within the Division. The selection committee, Annamaria Wenner, Peter Fowler, Jenn Kosses, Lynette Panarelli (faculty representative), and Tina Zunino (student representative) were impressed by all the nominations. We would like to again congratulate those who received an award and provide an excerpt from their nominations. This award is given to an individual who is influential in creating an inspirational work environment. The person is someone who encourages the involvement of others through teamwork. The recipient helps others be successful through role modeling, encouragement and inclusivity. This individual is able to positively impact, engage and support the Wentworth community. This award is given to an individual in recognition of work that has demonstrated the principle of putting students first. This individual provides programs or services that balance educational needs with customer service. The recipient strives to develop procedures, services, or programs that are both welcoming and efficient in order to enhance the overall student experience and encourage personal growth. This individual provides opportunities for students to be empowered within their academic and social lives at Wentworth. This award is given to an individual who demonstrates innovation through the development or enhancement of programs or services that meet the changing needs of the campus. The individual has an ability to be creative in the usage of people, budgets or technology. Their efforts contribute to creating a positive and inclusive work environment as well as providing quality service to students. This award is given to a committee or special project group for demonstrating great work which exemplifies collaboration, communication and community. The recipients work to create, support or strengthen an environment of being a “team player.” Their collective work has demonstrated the creation of new programs or services, improvement of current program or service and has resulted in high quality outcomes. This group exemplifies teamwork, inclusion and consensus-building as they work to achieve Divisional goals and objectives. Nominees for this award can either be within one department or include individuals from various departments. Thank you to our recipients and our nominees for their work and dedication to our Divisional vision: Every Student Thrives!